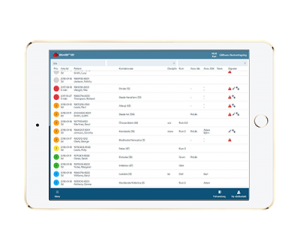 With Aweria, patient information is coordinated all the way from the dispatch center, via the ambulance and into the emergency department. Nurses and physicians get an overview from the very start and can control and plan their work. The result is safe and documented emergency care for patients and healthcare professionals alike. 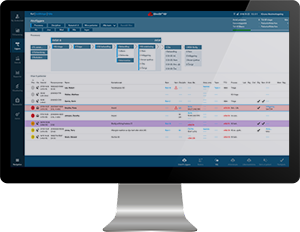 Aweria is the next generation information system for prehospital and hospital based emergency care, offering modern, high-quality software applications that provide healthcare personnel with a total overview of the patient flows in the emergency care chain. There are functions for e.g. structured care documentation, decision support, collaboration and communication. Aweria offers an Emergency Department Information System (EDIS) and Prehospital/Emergency Medical Services Information System in one and the same platform which manages the whole emergency care process as a whole. The platform itself is based on a digital infrastructure that coordinates all data and integrates with nearby external systems. 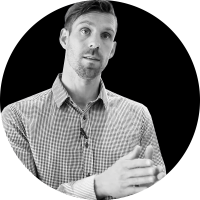 Aweria is an open and flexible system that harmonises with national e-health, enabling the customers themselves to choose which parts of the system they want to use. 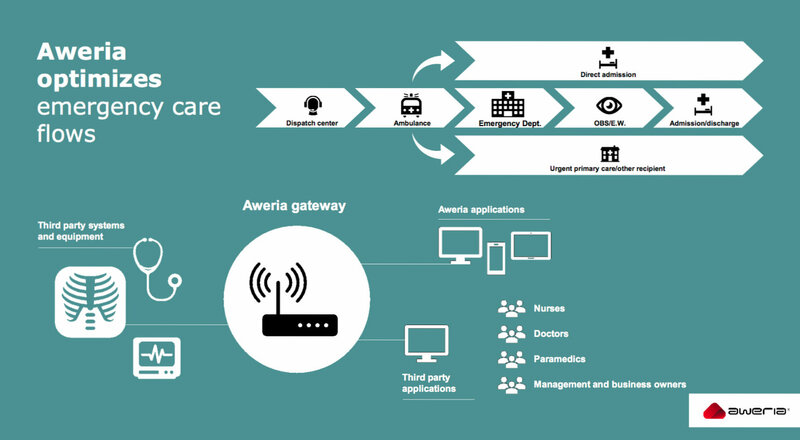 Aweria is then connected to the existing IT environment via standardised integration interfaces and thus creates a coherent emergency care chain. 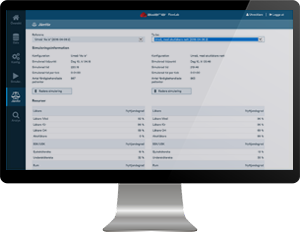 Examples of integrations include connection to monitoring equipment, single sign-on, two-way context management, lab and x-ray information systems, personnel directory, journal system, alarm center and vehicle computer in ambulances. Aweria is currently used within emergency healthcare in the Swedish counties of Västerbotten, Norrbotten and Halland. The core application in the Aweria platform, providing an overall view of a region’s ambulance services and emergency healthcare, with all the system’s parts accessible. Can be integrated with the hospital’s existing journal system or as part of a portal solution, and can also be run as a stand-alone application. Aweria Desktop is the application that is primarily used on desktop computers or laptops by personnel at the emergency department, ambulance center and hospital wards. Authorized users can see current patient visits, cases and ambulances. They can also read and write emergency journals in real time for all patients in ambulances or at emergency wards. Furthermore, the application contains functions for history, reports, data visualization and administrator functions. This can then be supplemented with other functions as needed. A platform-independent tool for ambulance personnel. Enables the journal-keeping process to begin at the home of the patient or in the ambulance. A tool that is adapted to the needs of ambulance personnel. Used on tablets. The tool is platform-independent, which means that it works equally well on an iPad as on Android or Windows-based devices. The journal-keeping process can be started smoothly at the home of the patient and/or in the ambulance. Login takes place via an Inera-certified solution, which means that users only have to log in with an SITHS card at the start of their shift. Thereafter they can quickly log in with a unique and personal pin code. The same login provides ambulance personnel with easy access to the patient’s care history via the NPÖ (National Patient Overview) service, irrespective of whether the patient lives within or outside the region. Aweria Prehospital has built-in functions that support the collaboration between ambulance personnel and e.g. physicians at the hospital, with the help of text and video communication. A platform-independent, mobile tool for the emergency department. Makes it easy to continue the journal-keeping process once the patient has been delivered by the ambulance personnel. 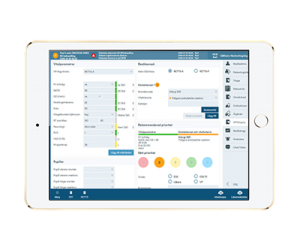 The mobile version of Aweria for personnel who work at an emergency ward or hospital ward with a tablet bedside or at another location. Based on the same technical solution as Aweria Ambulance, which means that Mobile is also platform-independent and thus works equally well on an iPad as on Android or Windows-based devices. Login takes place with a personal pin code. Includes digital journal documentation that follows the patient from the alarm centre and in the ambulance. Provides, among other things, access to the patient’s care history via the NPÖ (National Patient Overview) service. The tool for users who want to perform data analyses and see flow simulations, providing excellent decision-making bases for personnel who work on improving the flows within the emergency care chain. Aweria’s most advanced tool for data analysis and flow simulation is intended for use by care accountants, care logistics planners, process architects, clinic and department managers and others who have an overall responsibility for improving the flows within the emergency care chain. Helps to identify bottlenecks and propose improvements in the emergency care process, where it is possible to test proposed improvement measures and see the effects they are expected to provide via the simulator software, before actually implementing the measures in reality. Region Norrbotten was one of the first to implement Aweria’s digital platform in its emergency healthcare activities. Hear representatives for Sunderby Hospital talk about how their activities have been affected since the implementation. Would you like to see how the Aweria platform works in practice? Do you have any questions, or would you like to know more? Contact us! We would be delighted to visit you and demonstrate the system. Would you like to receive the latest news from us directly via email? Please subscribe to our newsletter, which we publish 4 times a year.